Wow. Look at it grow. Good luck on that project, and God bless. I was wondering if you may be able to tell me why many of my seedlings die off after germination. I started 100 seeds and after a few weeks many of them shrivel up and die. I've only been able to keep 10-20% of them healthy. Could it be over-watering, or under-watering? Or maybe a fungus that I cant see? I have a hybrid of seeds that im growing. Many are different colors. I even have one pink. 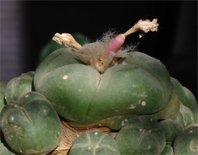 What are the color ranges for lophophora? Some seem purple, some red, and some brownish. It sounds like your seedlings are damping off. Damping off is caused by fungi in the soil and can be avoided by using sterilized containers and compost (microwave it and let it cool off before use). The disease is encouraged by humid conditions and is very common when raising plants from seed. Regarding the color of Lophophora seedlings (I'm assuming the question relates to seedlings), they are usually various nuances of green but can assume a purplish hue when exposed to too much light. The pink/purple/red/brown coloration could also indicate your plants are variegates (even though the differently colored patches usually are of a whitish/yellowish color) - if your plants retain the described coloration as adults, it would be very interesting. 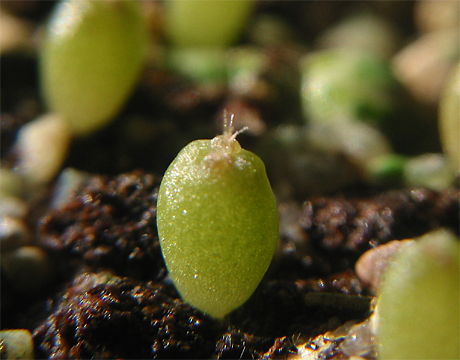 what is the most succesful medium for germination? im having trouble getting any to germinate how long does it take? Please refer to the answer in this comment. I have had some success with germinating my first few Lophophora Wiliamsii 6/10. I am concerned about their development though as my best developed cacti was white one morning when I went to look at it and has since then turned into mush. My other cacti germinated at the same time and are growing very tall and skinny and all my cacti are a very light green. I have been growing them on my stove with artificial light and think ineffective lighting may be the culprit. I sowed the seeds approximately 1 month ago. Can you confirm lighting is the cause with this little information? Thanks for your help, great blog. That definitely sounds like etiolation caused by insufficient light. If possible, move the seedlings to a brighter location (and take heed not to scorch them, if moved into direct sunlight). i planted some loph seed about 4 months ago and now they seem to be turning a very dark green colour i have taken them away from the windowsill because i live in the uk and it is now winter so it is too cold to keep them there, i think they may be lacking sunlight but i am not sure any ideas?